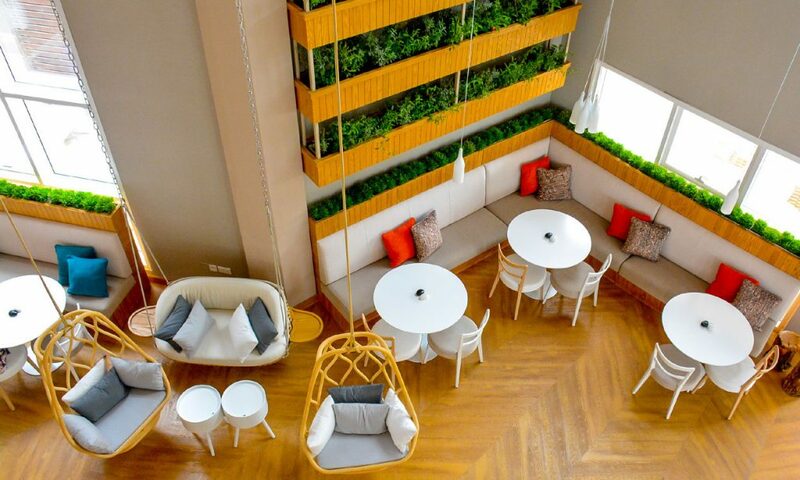 Grounded in good food is the amazingly innovative Riffa eatery that is OAK RESTAURANT. 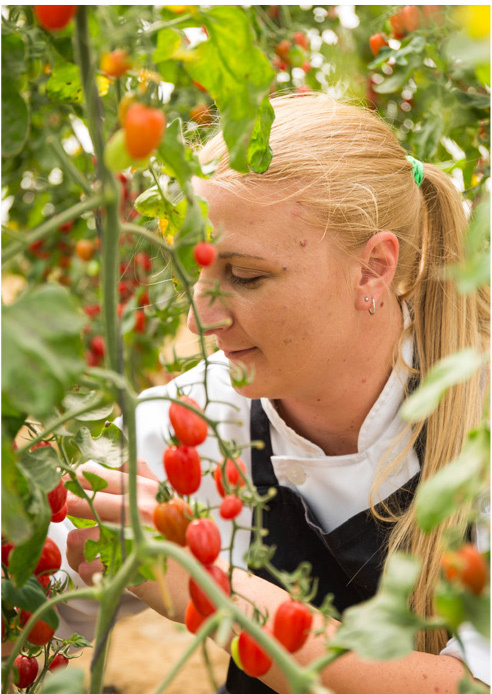 We talk all things organic with their EXECUTIVE CHEF CHANTEL and discover the story behind their illustrious furnishings. As Oak’s Executive Chef we would like to get to know you more, Chantel. Tell us briefly about your ‘roots’ and culinary background. I’m from South Africa and have lived and worked in the US, France and various places across the Middle East before coming to Bahrain. I have over a decade of experience in the culinary world and love to bring with me the global influences from my international travels. My culinary repertoire really grew during my earlier years at the Ritz Carlton in Florida, where I worked under an acclaimed former White House chef. Here I developed and refined my culinary techniques. How were you first inspired to delve into the world of cooking? I spent much of my childhood at my grandparent’s farm in South Africa. We got involved with everything from making the butter, planting, harvesting and racing around on tractors. I think seeing and being part of the farm culture, learning about where our foods come from and having that appreciation from a young age was a great groundwork for the work I do now. I didn’t show much interest in the cooking part until I was a teenager, and this is when I really started getting involved in the kitchen at home and experimenting with different recipes, of course using some of the produce from my grandparent’s farm! 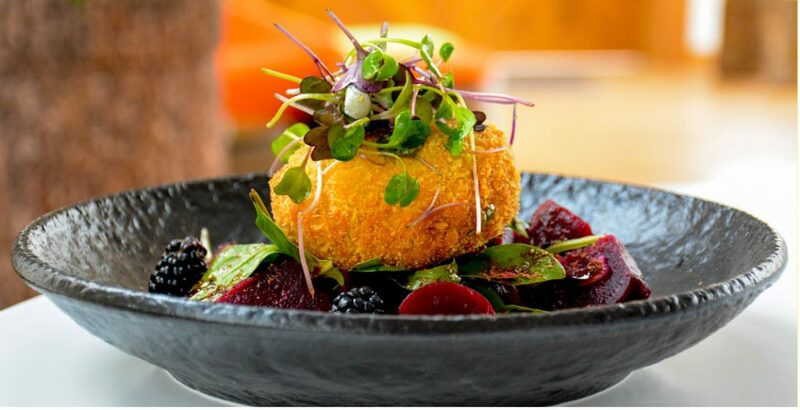 Oak Restaurant is proud to showcase that it’s rooted in good food. Tell us about this concept and why we should visit you in Riffa. At Oak we believe that good food comes from great produce. We want our diners to be regulars and offer an all-day dining concept, essential a ‘homeaway-from-home’, where you can drop by any time of day and get a tasty meal, friendly service and a beautiful space to enjoy it all in. We spend our time working with suppliers both locally and abroad, to ensure we get the best that is available. We also work with our own farm here in Bahrain, to grow vegetables and herbs where possible. Since Bahrain is renowned for its plethora of spices and ingredients, what specialties should foodies expect to see on your menu? I was really excited to discover the cherry tomatoes here in Bahrain, especially the ones we grow on our farm. The flavours are juicy, intense and perfect for many of our dishes. I use them in as many ways as possible, from oven roasting, semi-drying to preparing homemade tomato sauces. Your cooking philosophy in one sentence. I think it’s important to respect your roots and where you are; use as many fresh ingredients as possible; and always be exploring for new ingredients, flavours and dishes. 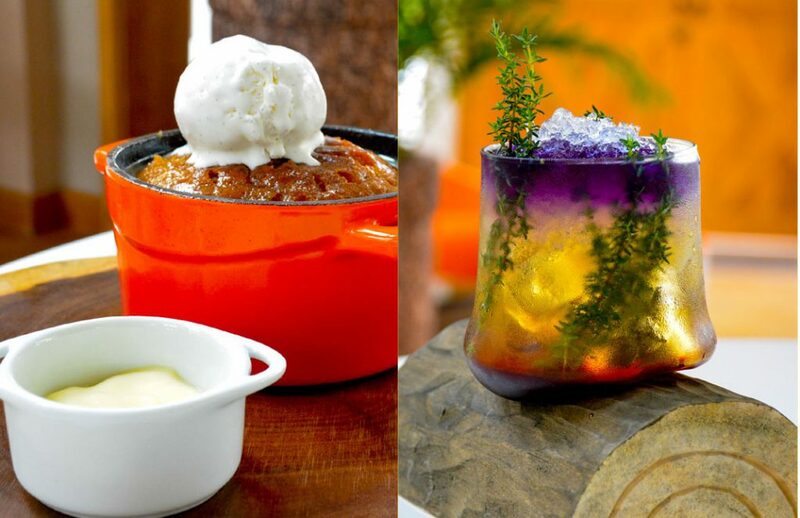 Oak’s concept was developed by Kingdom Gourmet. Jean Marie Lascelles Lloyd, Oak’s designer, has created a playful experience around the restaurant name. Furniture pieces such as the swing dining table, hanging chairs and axe legged tables, gently reinforce the Oak theme with a warm and whimsical touch. This is all sensitively created to ensure that the décor stays neutral enough for diners to be able to use the space as they want, rather than have it solely be a showcase for designer pieces. 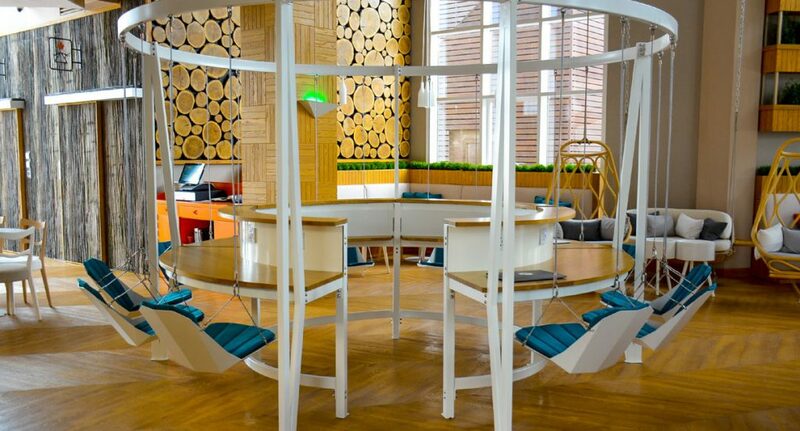 Duffy London have created a fun and inspiring experience for diners, with the floating table and swing chairs. Christopher Duffy is known for his playful and original furniture concepts that explore the theme of motion and gravity. These schematic trees were designed for Oak by John-Marie Lascelles-Lloyd, the interior designer of the restaurant. 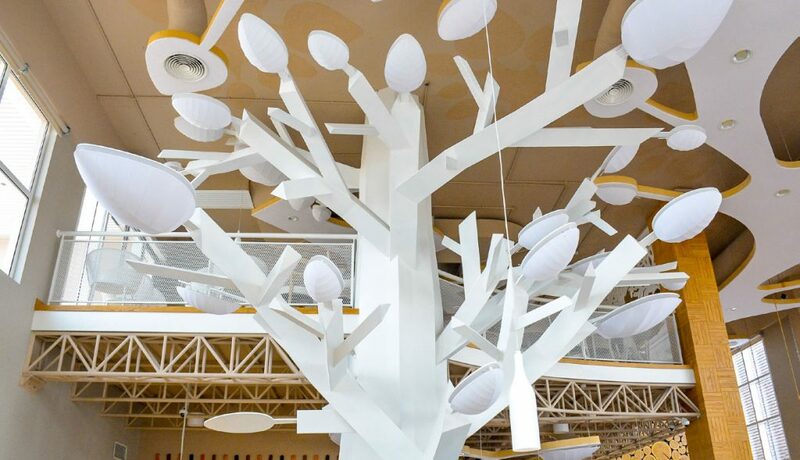 The trees are built around tree light fittings by Italian light specialists Karman. These were made by Duncan Meerding, a furniture and lighting designer in Tasmania. Duncan is inspired by the natural beauty of the Tasmanian wilderness, using materials that embrace their natural characteristics. As a blind craftsman, the relationship between light and shadow and light dispersion are integral to Duncan’s design process. Each Duncan Meerding Design combines traditional hand made techniques and modern manufacturing techniques through small scale production and is built to last. Importantly for Duncan’s work is sustainability and care for the environment throughout all his designs, with the majority of the timber sourced from ‘waste’ materials or faster growing robust timber varieties. This table combines art and function, with four polished hickory axes acting as the table legs. 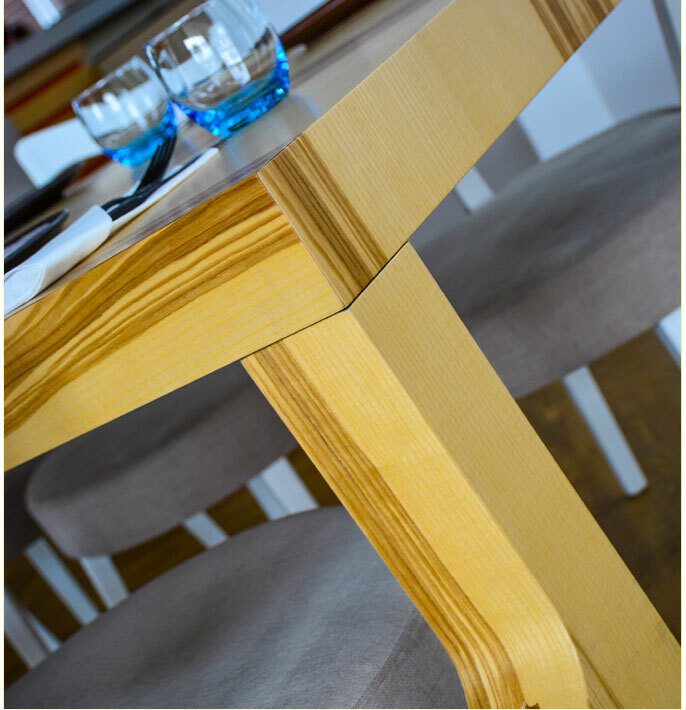 The timber used for this table is from the Forest Stewardship Council, which manages forests and other controlled sources. Duffy London play with the concepts of gravity, geometry and illusion in their product designs. The inspiration for this table came from the world of film editing, a fade is a gradual transition from one image to another. In the production process, raw material is turned into a finished object. 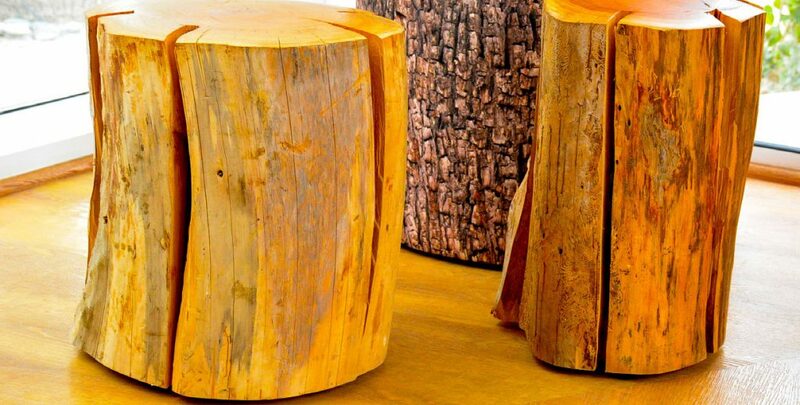 The immediate characteristic of the table is its ‘live edge’ legs, giving it a feel of an unfinished product. The irregularities of the bark are considered a merit, making each table unique. Overall it gives a beautiful soft effect, perfect for creating a warm and natural environment.